The achievement – which Owens and her family tirelessly worked towards, following Rumph’s death in 2005 – makes Wednesday’s anniversary a bit easier to bear. Shortly after Rumph’s death, the Owens family launched The Daniel E. Rumph II Foundation as a way to help them heal and help save others. Its initial goal was twofold: help raise awareness for cardiomyopathy, the disease Rumph unknowingly suffered from, and get defibrillators installed in all of the city’s recreation centers. Last year, the foundation got a big break. 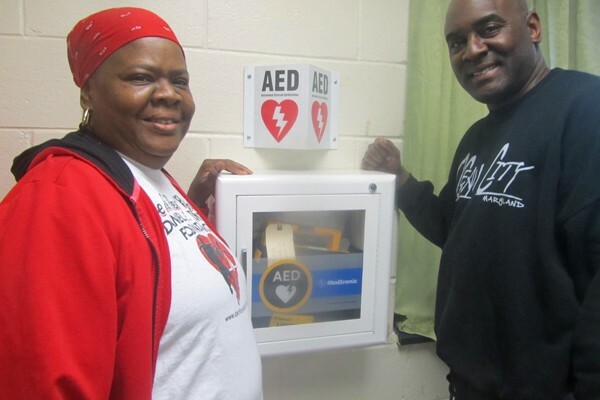 After being awarded a federal grant for new defibrillators, the Philadelphia Fire Department, aware of the Rumph Foundation’s efforts, donated all of their old ones to Parks and Recreation, said Marcus Owens. It was a joyous moment. “My brother had to go to a lot of meetings. He had a lot of doors closed in his face, but finally somebody opened the door and listened,” said Viola Owens. “That decision was just huge,” said Marcus Owens. The refurbished defibrillators were quietly installed last fall. The fire department could not be reached for comment. Over seven years, the foundation independently raised more than $35,000 to purchase and install devices in 13 recreation centers around the city, including the Daniel Rumph facility. Fundraisers – including an annual, multi-day basketball tournament featuring NBA and NBA-level talent with ties to the city – helped cover costs. After some early resistance, the city’s Department of Parks and Recreation gave the foundation the green light to carry out its mission. Officials said the department couldn’t do much more. “We always thought it’d be nice to have them, but the expense just wasn’t in our budget. It wasn’t really going to be something we could realize on our own,” said Terri Kerwawich, the department’s program director. Outfitting all of the city’s rec centers with defibrillators would have cost the department between $300,000 and $500,000, said Kerwawich. The 13 defibrillators purchased by the foundation will be installed elsewhere, potentially in the city’s Police Athletic Leagues. The Rumph Foundation will now turn all of its attention towards raising funds for cardiomyopathy screenings at recreation centers. It’s already held a few. “Instead of being reactive when something happens to a young kid, we thought we’d do something more on the front end of it,” said Michael Morak, the Rumph Foundation’s director of events, before last summer’s Rumph Classic “Save the Next Bright Star” Basketball Tournament. On May 8, 2005, Rumph, known to many as “Danny,” made his way to Johnson and Manheim streets following a Mother’s Day dinner two blocks away. Two hours later, Owens got the call that changed her life. Rumph, a standout point guard at Western Kentucky University, had unexpectedly collapsed on the hardwood. She rushed to his side. By the time rescue crews arrived, Rumph had passed out. He died before reaching Albert Einstein Medical Center at the age of 21. It was later determined that Rumph’s fatal cardiac arrest was the result of hypertrophic cardiomyopathy, a genetic disease that compromises the function of muscle tissue in the heart responsible for keeping the vital organ pumping efficiently. Oddly enough, Marcus Owens was diagnosed with the disease less than a week before tragedy struck. Rumph, however, had no idea he suffered from the same condition. “[Danny] was more worried about me not being able to play [basketball],” said Marcus Owens. Warning signs are few. The only way to diagnose cardiomyopathy is through a series of heart scans, including an echocardiogram. Rumph never had one. The anniversary of Rumph’s death remains a somber day for the Owens family and Danny’s friends. He would have turned 30 this year. Marcus Owens plans to stop by Rumph’s grave for a brief chat. He said he plans on mentioning his namesake foundation’s achievement. “I’ll be definitely talking to him like, ‘Man, this is going to be big. This is something big that we accomplished here,'” said Marcus Owens. That is an awesome cause. I love how Lee DeWyze is tnmeiag up with your incredible organization to create awareness to help save lives. Lee is the best guy ever. Not only is he an amazing artist, he’s a wonderful person with a huge heart. I commend you all!! !